MedBox Inc., which provides automated cannabis vending systems and consulting services to the medical marijuana industry, saw its first-quarter net income fall 56% as increased marketing, commissions and other expenses outpaced revenue growth. The California-based company reported $272,018 in profits for the first three month of the year, down 56% from $622,150 during the same period in 2012, according to its latest financial report. Revenue rose to $1.75 million vs. $1.46 million in the year-ago period. The 20% sales increase shows growing demand for the company’s products and services, which bodes well for the future of MedBox as the medical marijuana industry continues to expand. But it wasn’t enough to offset a big increase in costs during the first quarter. Expenses hit $1.3 million – nearly triple the level a year earlier. Medbox spent $293,595 in marketing and advertising in the first quarter, up significantly from about $38,000 over a year earlier. Commissions totaled $50,000 vs. none in the year-ago period, while legal and accounting fees rose nearly tenfold to hit $316,953. Increases in construction/buildouts, outside services and salaries also contributed to the spike in expenses. The company could not be reached for additional comment on its financials but said in the release that it is poised to enter new markets quickly. Several states could legalize medical marijuana in the next couple weeks. Illinois lawmakers recently approved a bill that would allow up to 60 dispensaries statewide, and the governor will now decide whether to give it the green light. New York is also considering legalizing medical marijuana, while lawmakers in Nevada are weighing a measure that would provide for dispensaries (the state already has medical marijuana laws on the books but doesn’t allow MMJ centers). Aside from these potential opportunities, MedBox said it has inked $1.5 million in contracts that were not recorded in the first quarter because they have not yet commenced. These contracts are the result of the company’s move to offer in-house financing for its technology, which should further boost sales going forward. From a cash perspective, the company has $1.04 million in reserves vs. $125,533 a year ago, largely the result of a recent stock offering that raised $1.25 million. Its cash balance is also up slightly from $1.03 million at the end of last year. 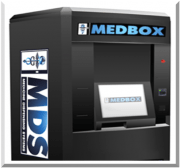 MedBox shares saw a slight bump after earnings were released yesterday, rising 66 cents – or 2.4% – to close at $28.65. The stock often experiences bigger fluctuations on a day-to-day basis, in part because of the relatively low number of shares on the market. At one point last fall, for instance, its shares rose from $4 to more than $200 in less than a week before losing most of those gains the next day. The relatively modest movement since earnings were released indicates that investors are neither thrilled nor extremely disappointed in the results. Its shares, which trade on the over-the-counter market under the symbol MDBX, are hovering around $28.50 today. MedBox has filed forms – including audited financials for the past two years – to become a fully reporting company with the US Securities and Exchange Commission, which should help boost its credibility with investors by offering more transparency.